MEMOFIN - Guidelines on key concepts of the AIFMD - L'information financière que vous ne trouvez nulle part ailleurs ! On 23 February 2012, ESMA published a discussion paper on key concepts of the Alternative Investment Fund Managers Directive and types of AIFM (ESMA/2012/117), which was followed on 19 December 2012 by the publication of a consultation paper on guidelines on key concepts of the AIFMD (ESMA/2012/845). The CP set out formal proposals for guidelines ensuring common, uniform and consistent application of the concepts in the definition of ‘AIF’ in Article 4(1)(a) of the AIFMD by providing clarification on each of these concepts. 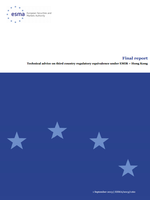 This final report sets out the final text of the guidelines on key concepts of the AIFMD.